After sale by the scrap dealer, the former MGB was used as an accommodation barge by a sailing school at The Hardway, Gosport, and during this period it is thought, but not confirmed, that she had been named JOLLY ROGER. In 1964 the hull was purchased by Mr John Ould who later fitted her out as a house boat, renamed her CRESTA, and placed her on a mud berth at Quay Lane Boatyard, The Hardway, Gosport. Sixteen years elapsed before the CRESTA was sold on again to Mr John Coker on the 11th February 1980. The CRESTA remained at Gosport for a few more years, until she was purchased by Mr John Pepperell on the 19th August 1984. 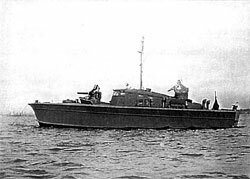 He later had her towed from Gosport to a mooring on the Hamble River, at Bursledon. Four more years later CRESTA was sold on the 13th January 1988 to Mr Guy Webster who planned to restore her to her wartime appearance. 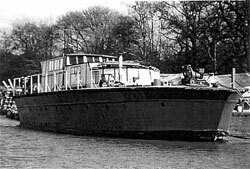 The craft remained at Bursledon, and after her former identity had been established, restoration started. The full restoration was carried out over several years by Guy Webster and his father, Mr Art Webster, to whom ownership passed on the 12th November 1992. In the mid 1990's MGB 81 was moved downstream on the River Hamble, from her Bursledon mooring to one at Crableck Marina. 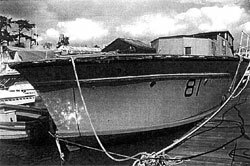 MGB 81 remained at Crableck Marina until the 17th September 1998, when she was acquired by Philip Clabburn, for Powerboat Restorations, and taken to the Army base at Marchwood. On Monday the 28th September 1998, she was lifted out of the water at Marchwood Military Port and placed in an area set aside by the Army authority where some stripping out prior to rebuilding could be done safely. Work started in May 1999 and included stripping out the boat's interior, replacing some of the deck and removing the superstructure. On the 23/24 September 1999 MGB 81 was lifted on to a universal trolley and moved the short distance from Marchwood Military Port to the BMPT site at the former Husbands Shipyard where restoration continued. Over the next two years the hull was sand blasted both internally and externally and all damaged and non-standard planking replaced - some on the port quarter had been previously replaced with marine ply. A complete new superstructure was fabricated from copies of the original BPB plans and efforts were made to acquire new engines for the MGB. Several enquiries were made and some Packard engines were found in Gibraltar. 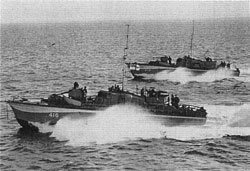 However Powerboat Restorations felt that petrol engines would be too expensive to run, and hence three MAN diesel engines were acquired for fitting in the craft. An extension was built onto the sheds at Cracknore Hard to house the MGB whilst restoration took place throughout the whole year in all weathers. A delicate operation had to be carried out part way through the process when the MGB was removed, turned over and replaced in her temporary home.